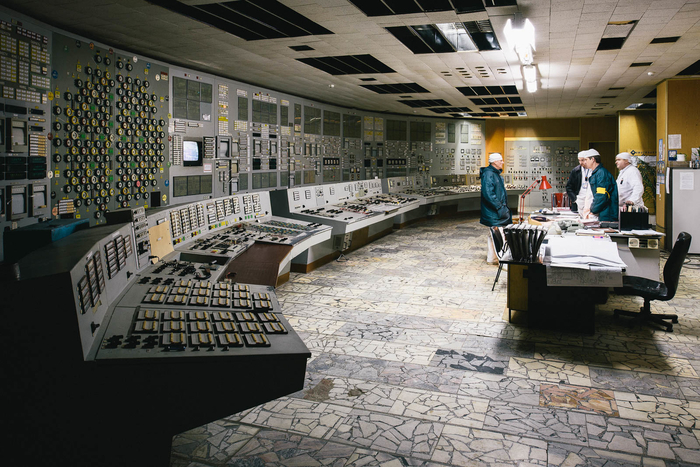 Chernobyl Nuclear Power Plant, Control Room 2. Image credit: by Michael Kötter via Flickr. In the ruins of the Chernobyl Nuclear Power Plant—an area deemed unsafe for humans for the next 20,000 years after a catastrophic failure—life thrives. Fungi that reside there, along with other organisms that can survive large radiation doses, must have strategies to cope with the DNA-damaging effects of living at a meltdown site. In the April issue of GENETICS, Repar et al. report that radiation-resistant prokaryotes tend to have higher rates of genome rearrangements—a sign of improperly repaired double-strand breaks in DNA—than related species do, meaning that even these hardy organisms can’t fully prevent or fix radiation-induced DNA damage. The failure to repair all DNA damage doesn’t result from lack of trying. Prior research showed that Deinococcus radiodurans, one of the most radiation-resistant organisms identified to date, has a special method for repairing double-strand breaks in DNA, and along with several other radiation-resistant prokaryotes, it can patch its genome back together after hundreds of double-strand breaks. Variation in the DNA repair machinery is under positive selection in radiation-resistant bacteria but not in related nonresistant bacteria, indicating that there’s a need to optimize these genes’ functions to cope with radiation. Despite their adaptations to radiation bombardment, these species’ genomes are more shuffled around than their more radiation-sensitive relatives’ are. This suggests it’s not possible to prevent or patch up all the damage, even with super-charged DNA repair, but it’s also conceivable that the increased rate of genome rearrangements might actually be beneficial in conditions of stress. The rearrangements could cause mutations that allow the radiation-resistant organisms to survive in their dangerous environments. But Repar et al. found that radiation-resistant organisms were no different from their nonresistant cousins in selection for genome organization (i.e., against genome rearrangements), implying that their high rate of rearrangements does not affect their ability to adapt to radiation stress. Ultimately, although these extremophiles are uniquely skilled at fixing their genomes, they still end up with battle scars. Repar, J.; Supek, F.; Klanjscek, T.; Warnecke, T.; Zahradka, K.; Zahradka, D. Elevated Rate of Genome Rearrangements in Radiation-Resistant Bacteria.